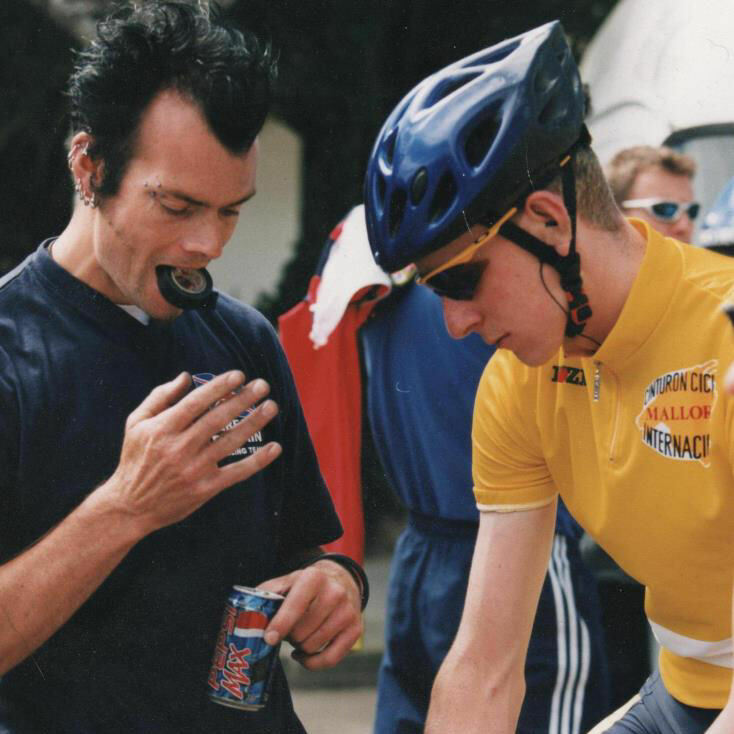 Me with Sir Wiggo in 2001. Hi and welcome to the Bike Magician website. I'm Colin Gardner and have been a cycle mechanic for over 30 years. I've always enjoyed cycling and started racing in 1979 in local time trials. I always wanted my bike to work perfectly even then, so taught myself the basics. The opportunity of a Saturday job came in 1980 and since I started it's the only job I've ever really wanted to do. I was taken on full time as soon as I left school and spent two years working on all kinds of bikes, from kids' bikes with stabilisers to the best quality race bikes available at the time. But "the best" in 1981 was nothing compared to the quality of bikes available today, though. Even mid-range road bikes are now better than the anything available at that time. It was a very good grounding though and I have been able to see and keep up to date with the all new technology as it appears in the road scene - lots of services to Sturmey Archer AW 3 speed hubs too. And no, I haven't forgotten about mountain bikes but actually, back then there weren't any. They only appeared a few years later. As time went by, I started to specialise in the area of race bikes, on the road, off-road and in the new sport of triathlon. This afforded me the opportunity to travel the globe supporting some of the world's top athletes at major championships. In 1999 I joined the British Cycling WCPP group, newly formed by Peter Keen with the goal of producing medal-winners at all the major cycling championships. Within nine month Jason Queally had won gold at the Sydney Olympics. I was initially working with the endurance team comprising of riders including Sir Bradley Wiggins, Chris Newton, Rob Hayles, Brian Steele, Paul Manning and Steve Cummings. More track work followed where I was assisting the likes of Sir Chris Hoy, Craig MacLean and Jamie Staff. Now I have set up Bike Magician, based in Kirkham near Preston providing top quality workmanship to all cyclists. Please feel free to contact me regarding repair and servicing.